Sahajanand Laser Technology Ltd. (SLTL) is one of the largest manufacturer of equipment in the world for the Diamond Sector. Since year 1989, the company has grown leaps and bounds with offices in USA, Germany, UK and China and exporting to over 24 countries such as Russia, Canada, Israel, Switzerland, Poland, Singapore, South Africa, South Korea, Sri lanka, Thailand, Namibia, Botswana, Saudi Arabia, Iran, Dubai, Angola, Armenia, Zimbabwe, etc. The Company truly has Global Footprint. With more than 10,000 successful installations worldwide. SLTL commands a lions share in the diamond Industry. The innovative cost effective products manufactured under strict quality standards for superior and efficient working has gone a long way in contributing to the company's success SLTL, also takes special effort towards operator training and education SLTL is a ONE STOP SHOP, for all the clients. SLTL uses wide range of lasers (YAD, Diode, CO2, Fiber, UV, etc.) for varied applications such as Laser Cutting, Marking, Welding, Micro Machining, Solar Cell Scribing/Cutting, Scanning, Diamond processing, Medical Surgeries, Medical Stent Cutting, etc. and thus cater to the needs of diversified Industries. It takes pride in being one of the few companies providing indigenous solution to Scientific & Research Institutes / Government organizations in India and abroad. The Company has been bestowed with numerous awards by national and International governments/ institutes. Empowering innovations, SLTL has come out with a state of art product NEBULA for high end diamond planning. This product comes with Auto Inclusion detection upto VVS clarity. It provides a complete package of auto inclusion detection , planning and marking on the stone. The Nebula is developed from Space Qualified technology and is the future for the diamond industry. 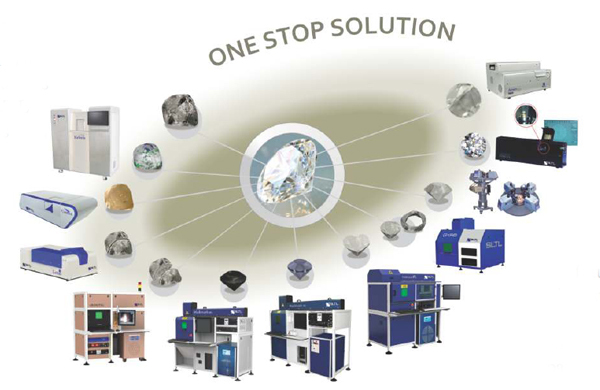 With company's long history about knowhow of diamond processing as well as space research, it has come with this product that adheres to the requirement of the industry. It is Safe, Secure and Sure (perfect) in mapping the rough stone. This system will help manufacturers and rough buyers in knowing the exact position of the inclusion inside the rough stone so as to perfectly plan the polished. This not only averts any kind of risk in monetary terms but also assures the buyer of the end result (Clarity & Size) beforehand. As there is no need to open windows, A pre-processing of the stone is not required. It also saves time in decision making and thereby production. The company also has 24X7 service set-up for after-sales support.